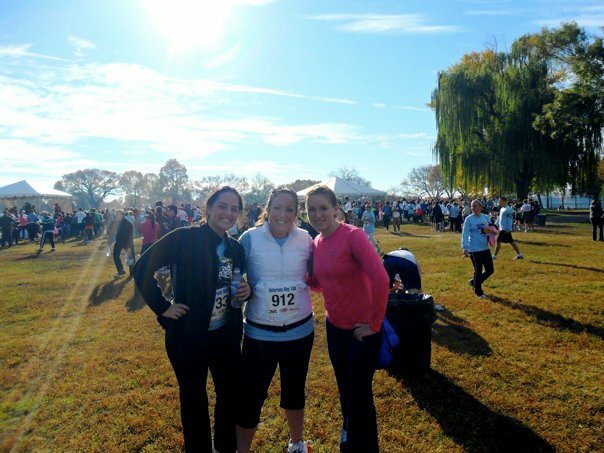 In the Fall of 2010, a mere three months after graduating from college, starting a job, and getting a big-girl apartment, my friend Elsa somehow managed to convince me to sign up for the Veteran’s Day 10K in Washington DC. Up until this point, I LOATHED running. I will choose to blame it on lingering scars from the mandatory mile in 5th grade gym class (if you read my “About” section you would know I was horribly overweight as a child… that mile was ugly). Even though I loved working out, I had never gotten up above 3 miles on a treadmill without stopping. I had a million excuses why I didn’t want to do it. “I like to exercise but I don’t want to turn it into a competition. I don’t think that would be good for me” “Runners are weird” “Runners are mean” “I’m not a runner”… the list goes on. But for whatever reason (READ: I gained 40 lbs in college) I decided to give this 10K a go. I vaguely followed a training program I found online and was lucky enough to have the support of both Elsa (fellow WordPress blogger… check her out!) and our friend Haley the day of the race. Astonishingly, I finish the 10K (ran the whole time… whoot whoot) in 1:07:03. Just like that… I was hooked. Racing was literally the most addicting experience EVER. I had never felt more accomplished in my whole life, and the environment was so much more supportive than I ever thought it would be. Since my first 10K a year and a half ago, I have run one 5K, two 8Ks, two 10Ks, two 10-milers, and five half marathons. I still can’t even tell you how this happened but somehow, in spite of myself and all my doubts / insecurities / childhood gym class scars, I became a runner. And in 10 days I will do something that I never ever ever ever ever believed I could… run a marathon. That’s right ladies and gentleman, on Saturday April 28th, 2012 I will compete in the Rock’N’Roll Nashville Country Music Marathon. I am so honored by the (however undeserved) credit you gave me for my role whetting your appetite for racing. I wouldn’t have encouraged (forced) you to run the Veteran’s Day 10k if I didn’t see the “runner at heart” twinkle in your eye. But I do remember how nervous you were and it is so funny to pit that scared girl against the fearless chica that’s about to kick the living ish out of Nashville. There’s nothing like having a goal and shocking yourself by completing it. They should teach that in gym class!!!!! Oh and I am SUPER proud of you. LOVE YA! Good luck on your 1st marathon next week! You are motivating me to want to run again! !